Jeff Malkoon, owner of Peanut Butter Americano, holds a sample four-pack of jars, which is a great option for people who want to break up the set to give to various friends or family members as holiday or hostess gifts (photo by Patty Talahongva). “We offer six delicious flavors,” he says, all of which are all-natural and sweetened with honey and brown sugar. The nuts are freshly roasted and ground every week in Phoenix. Malkoon explains that it’s best to roast as close to grinding as possible for a fresh product. The Choco Blanco has four grams of sugar for each 2 tablespoons, which makes it sweet but not nauseatingly sugary. It’s a staff favorite and it’s also popular with the customers. For a change of pace, PB Americano also offers almond butter. The Cinnamon Roasted Almond Butter is a new release that is fast becoming a favorite among customers, he says. A 6-pound tub sells for $39, which is 35-percent off individual jar pricing. The jars are 8 ounces and sell for $6 each. You can purchase a sample pack of four jars for $22. Malkoon says several of his customers get that pack and split it up to pair with other gifts baskets. Malkoon’s family has lived in the North Central neighborhood for three generations. His office on Central Avenue is right across from Brophy College Prep, where he graduated before going on to Arizona State University to earn his undergraduate and graduate degrees. Then he took off to South America on a six-month backpacking trip. While in Uruguay he worked with the group, “A Roof for My Country,” which builds homes for the indigenous people. He also noticed that while peanuts are a huge export crop there, the locals didn’t seem to eat the high-protein food. The idea of creating a tastier peanut butter started to form in his head. He also wanted to make something with less sugar and oil. When he returned home, he started trying out different recipes in his mom’s kitchen. While it is mostly an internet business, several local retail shops carry PB Americano products such as the French Grocery at 7th and Missouri avenues, Luci’s Healthy Marketplace at 16th Street and Bethany Home Road, Whole Foods at 20th Street and Highland, and the Queen Creek Olive Mill store in the Union Shops at Biltmore Fashion Park. You also can find the tasty jars of goodness at many farmers markets. For a list of locations or to purchase online, visit www.pbamericano.com. 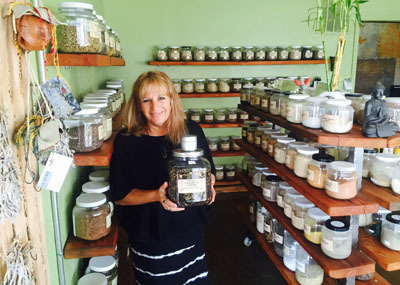 Most likely you’ll find the perfect tea to pair with your peanut butter or almond butter sandwich at The Green Goddess House of Herbs, 4232 N. 7th Ave., which is owned by Sue Meyers. The storefront in the Melrose District also houses her long-time neon business, Bend a Light Neon. Even the name, Green Goddess, is a reminder that all herbs come from the Earth. It’s a natural way of taking care of your body. One spice that is beneficial to combat inflammation is tumeric. Kava kava can be used for stress relief, important for the stressful holiday season, and people also can use catnip. Just in time for the cooler winter temperature is the apple caramel almond tea. And yes, she also has a pumpkin spice tea. Or try the holiday tea, which features cinnamon and cardamom and gives you the feeling of sitting by a warm fire on a snowy day. You also can find teas for boosting your immune system, teas to help you sleep and teas to wake you up. Meyers says customers can do research to learn which herbal tea would benefit them the most. If she doesn’t carry it, she can special order it. For customers who don’t want to brew and drink a tea, she sells the herbs in capsules. Meyers says a two-week supply of tea costs less than $20. The most expensive tea is less than $6 an ounce. Capsules range from .13 to .30 cents each. Tea Tuesday is a good time to visit and try out featured teas. Stop by any time during regular business hours to have a taste. Meyers also offers a line of essential oils and a few body scrubs. She often posts special events on her Facebook page, Green Goddess House of Herbs, so check it to see when her next product demo will take place. She also can help you find herbs for your dogs to keep their coats shiny or for other things. Visit her Facebook page or call 602-266-8177.